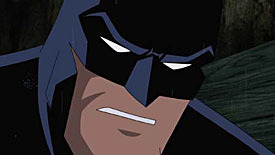 A lot of collectors - including me - were taken by surprise by the announcement of a Mattel 6" series based on the new Superman/Batman: Public Enemies animated film (in turn based upon the popular Jeph Loeb/Ed McGuinness comic). It wasn't clear how much the line would be compatible with DC Classics, although it looked as though the figures reused many parts from that line. What got me, though, was that the line was finally offering me the black-and-gray, black-bat-symbol, pouch-belt Batman I'd wanted for so long. Now the series is hitting Target, their exclusive home. If you haven't heard, it's coming in two waves - the first has the regular Superman and Batman, along with Icicle and Banshee. The second wave will have Black Lightning, Major Force, and the Batman and Superman variants (a shiny blue Superman and a blue-and-gray Batman). Unfortunately, you won't be able to put together the Brimstone BAF until the second wave comes out. Or in my case, never, since I'm only planning on getting the Batman. Let me be up front: these are not the same as DCU. They're a bit more cartoonish (especially the heads), but more importantly, they're a bit larger. 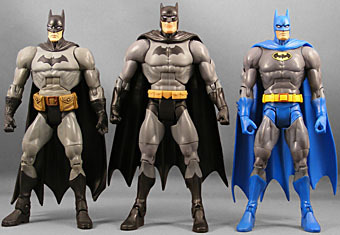 Batman will not quite look in scale with your other DCU figures - he's going to look like he's 6'6" or so, and quite beefy. 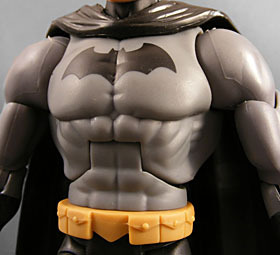 I've been trying to figure out where PE Batman's torso sculpt is being reused from, and I'm just not sure. It looks more muscular than DCU1 Batman's torso, but not as ripped as DCSH Batman's. It may be a brand-new sculpt. A brand-new sculpt that is a bit disappointing, because it lacks features found on its DCU brethren: namely, sculpted boots, gloves, or underwear. All of it is just painted on. My hunch tells me this is because it's intended to mimic the cartoon's style, although I'm sure the fact that it also allowed Mattel to use the same body over half the line's figures (Superman, Black Lightning, Major Force) didn't hurt, either. 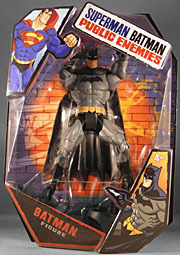 It's the exact same thing DC Direct did (and heck, is still doing) with their Superman/Batman McGuinness-style figures. Of course, Batman does have his gauntlet spikes, so I'm not clear on why the edges of the gloves weren't sculpted. Perhaps it's easier or cheaper to add spikes to an existing forearm sculpt than create a new one. His hands are fists, with no way to hold, say, a batarang. Not that he has one or anything. All that said, the body does capture the beefier look of the McGuinness style used in the animated film, while still toned down from the full-on McGuiness look of the comics. Basically, you could put these figures alongside your DC Classics and get away with it if you didn't mind them being just a bit large and beefy, and the cartoonish heads. The paint work is minimal. I understand that the tips of the "boots" are pretty bad on a number of the figures, so that's something to watch out for. It's pretty good on my own figure, however. The black bat symbol is clean, and the work on the head is fairly sharp, with just a little bleed under the left eye. 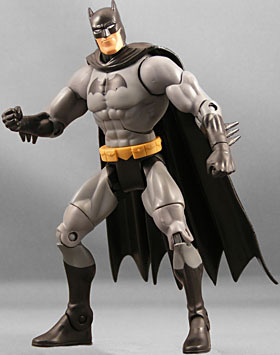 PE Bats has the articulation as the other DCU figures: balljointed shoulders, H-hips, hinged knees, elbows, torso and ankles, and swivels at the biceps, wrists, waist, and thighs. The head appears like it should be a balljoint, and there's a tiny bit of motion aside from a left-to-right swivel, but not much. Given how important I find this joint to be, this problem knocks the figure down a bit on the quality/value scale. However, none of the joints were stuck, aside from the continuing problems with the neck (very little motion here except side to side). 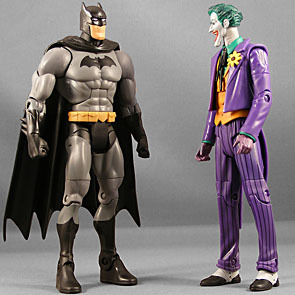 Batman comes with a stand and Brimstone's groin area. There are tons of potential gadgets and gizmos from the Public Enemies storyline he could have come with, and it's disappointing not to get any for the $13 retail price. Aside from the aforementioned neck joint issue, Batman's cape is a little screwed up where it attaches to his body in the back. It looks like it was attached while the cape plastic was still too hot, and so it melted a bit to the body. Perhaps most surprisingly, the Public Enemies figures come in new packaging, and frankly, it's nice just to get a break from the standard DCU design. But Mattel has done a nice job here: there are some catchy graphics, and I like the "wanted poster" style. That said, I'm not sure how much these will pop on the retail shelf, particularly since they look a bit like some of the Marvel packaging. Painted-on boots and gauntlets, no real accessories, the neck and cape QC issues... while I wanted to like this figure, since it appeared to finally be a DCU version of the Batman I've wanted since the line began, I just don't think it measures up. DCSH black-and-gray Bats still reigns supreme in my book.